1.Press! This is so important if you want your project to look great. Don’t ever skip an opportunity to press a seam. My iron is always set up and ready when I am sewing. It will not only help everything lay flat, it also is very important for easing in sleeve caps and getting curves to behave. 2. Hold your thread tails when you begin sewing. This is something I do without even thinking about it, but it is something that many beginning sewers struggle with. This photo is not actually how I hold my thread tails. I usually have one hand controlling the fabric and also putting light pressure on the thread tails, but I wanted to make sure you understood what I was talking about. Because the threads are ‘locking’ together, they pull against each other slightly. If there is nothing for them to pull against then the thread tails will sometimes get pulled down into the machine and form a knot on the underside of your project. I remember struggling with this when I first started sewing. I thought there was something wrong with the machine, and I couldn’t understand why it happened sometimes but not others. Once you have a few stitches completed, you do not need to hold the thread tails anymore. Now the thread is anchored by those first few stitches and cannot be sucked into the machine anymore. 3. Use glass head pins only. This is something I learned during my internship with the incredible seamstress Nora McCray. These are usually sold as quilting pins. The regular pins that are sold to home sewers have plastic heads that will melt if they get too close to an iron. I don’t even own plastic head pins anymore. I have thrown them all out. Glass head pins will help you enormously when you are trying to ease fabric as they can be ironed over. 4. Don’t be afraid of hand sewing. It will elevate your project tremendously. I only hand sew blind hems. 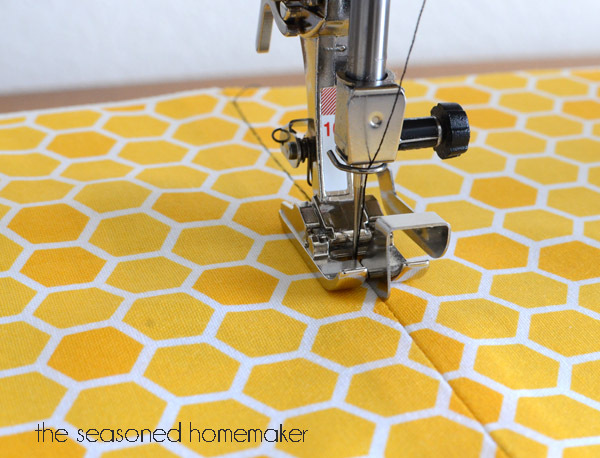 Most home sewing machines have a stitch that is supposed to mimic a blind hem, but it just can’t compare to a truly blind hem that you can achieve through hand sewing. I also use hand sewing to temporarily secure fabric that is slippery or for whatever reason cannot be easily controlled with pins. This is an example of a slippery, unruly fabric that I controlled with strips of interfacing and hand stitches that I removed after the pocket had been machine sewn into place. 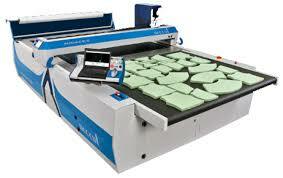 Automated cutting equipment, that cuts, notches and marks the pieces all in one. Folders which fold the fabric for things like waistbands, edge binding, straps, hemming etc. 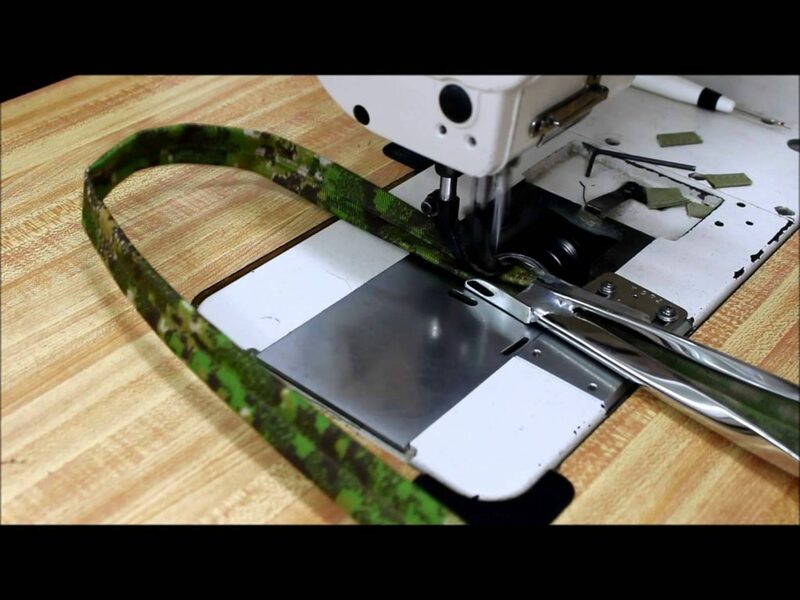 There are often folders available in the form of feet for home sewing and they can be a great investment, but you are probably going to run into situations where you just don’t have the right size folder and it may take you an hour to do something that would have taken a few minutes in a production setting. Automatic sewing equipment. 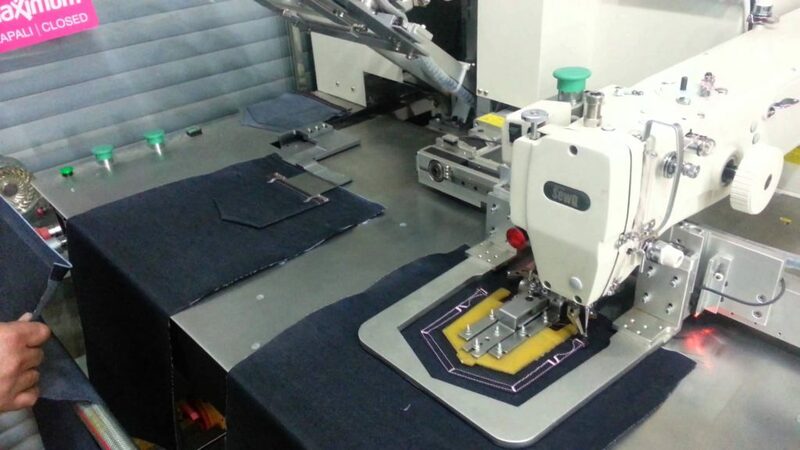 There are automatic machines for many common sewing steps such as setting pockets. The point is, quality clothes are going to take time, so don’t expect to complete a dress in few hours. Especially not if you are a beginner. 6. Use interfacing when it is called for. 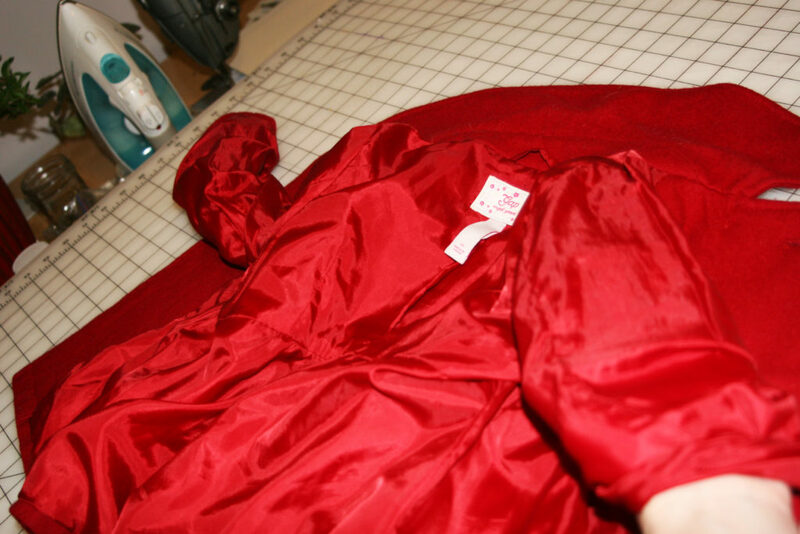 I used to skip the interfacing all the time when I first started sewing. That was a mistake and my projects looked sloppy because of it. 7. Make a muslin to confirm fit. This is like a practice garment made out of cheap fabric. You can skip things like pockets and even closures (You can just pin it closed on your body). This is just to make sure that it fits correctly. The name comes from the type of fabric that is typically used, but you want the fabric that you make the test garment out of to have similar properties to the fabric that you will make the final garment with, so you should not always use real muslin fabric. I have inherited a ton of fabric and I also pick up cheap fabric when I see it in the remnant area at Joann’s to use for this purpose. 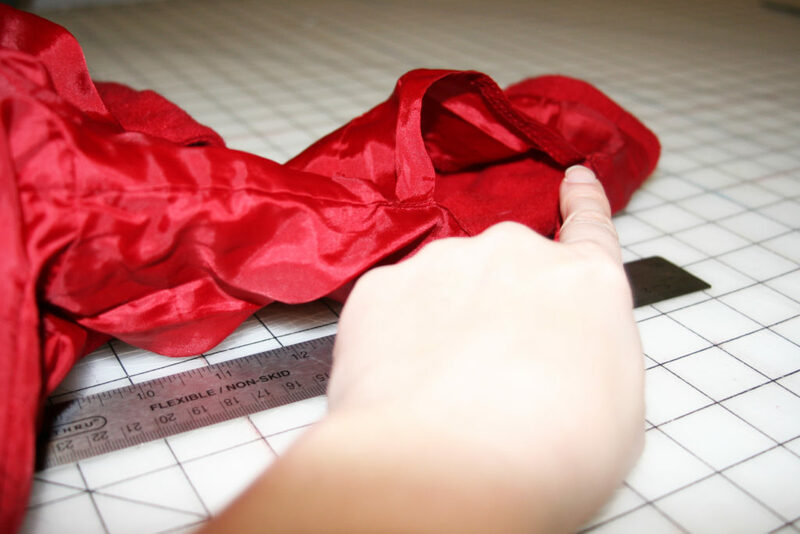 At first you may not be able to make fit adjustments, but at least you can check that you are making the correct size and that you like it enough to put in the time and money to make it out of the real fabric. 8. Pay attention to the type of fabric that the pattern calls for. If it calls for 100% Cotton plain weave, you cannot use Jersey knit. It absolutely matters and your projects will not look or fit the way you expect if you do not use the right fabric. That does not mean that you cannot ever sub fabric. I sub all the time, but I also understand the difference between fabric types. If you love something and it is not what the pattern is calling for, go find what the pattern is calling for and feel it, stretch it in both directions and decide if the fabric that you like is similar in character to the fabric that is being called for. If it is similar then go ahead and sub, but if not then leave it behind. 9. Pay attention to the grain line. The long line on the pattern pieces represents the grain line of the fabric. That means that the line should run parallel to the selvage of the fabric. If you ignore this line and cut your pattern pieces laying the wrong direction many terrible things could happen. 10. Don’t try to sew with the presser foot lifted. 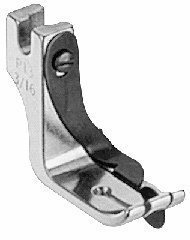 When you raise the presser foot, the tensioning disks that tension the top thread are released to allow you to pull the thread easily. If you try to sew at this point, there will be no tension on the thread and it will form big loops on the underside of the seam and might just make a big knot. This is why there are special feet that you have to use for free form quilting. The foot for free form quilting is a little bit short, so that even though you put the presser foot in the down position, the foot does not actually touch the fabric allowing you to move the fabric freely. 11. 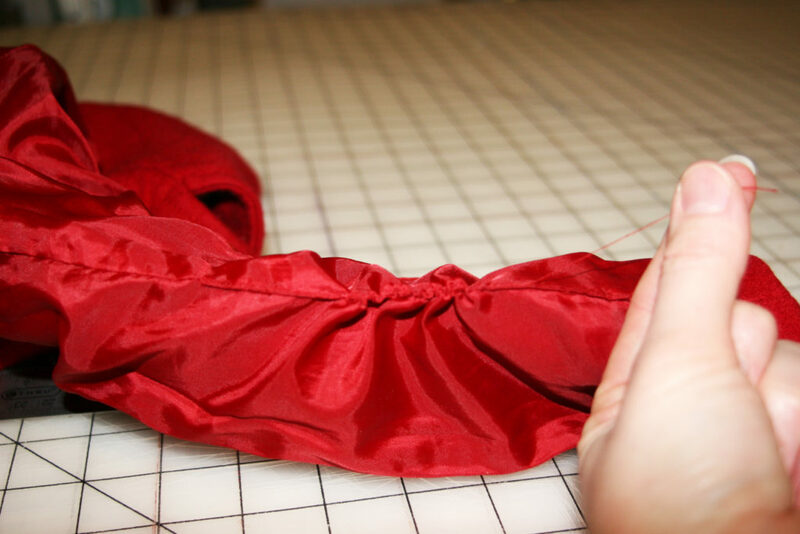 Don’t tug on the fabric if it does not easily pull away at the end of a seam. If you have finished a seam and you lift the presser foot to pull the project away and clip the threads, but it seams to be stuck, do not tug on it. What is most likely happening is that the top thread is at a point in its rotation around the bobbin where it is on the far side. All you need to do is advance the hand wheel slightly and allow the thread to advance in its rotation around the bobbin. Then it will be easy to pull it out and clip the threads. 12. Prewash your fabric. Do not skip this step. The fabric will shrink after you wash it the first time, and did you really just put in all that effort to have the damn thing shrink and not fit after the first wash? I usually wash my fabric at least twice and if it is something that I know is going to shrink a ton, like silk, I will wash and dry it 3 or 4 times. To finish the belt on your wrap skirt you have two options. Stitch in the ditch. This is stitching directly into the joining seam. Press under 1/4″ on the layer of the belt that has not yet been secured. Because you stitched 3/8″ on the belt ends, you will have to tapper to 3/8″ as you get close to the edges of the skirt. Then stitch in the ditch to secure the inside layer of the belt. Top Stitch. Press under 3/8″ on the layer of the belt that has not yet been secured. Then stitch close to the seam that joins the belt to the skirt on the belt side. This will secure the inside layer of the belt. Remember to back stitch at the beginning and end of the top stitching. 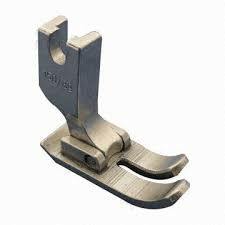 If you have a top stitching guide foot, or a stitch in the ditch guide foot that will be really useful for this step. Here are some examples of what that might look like. 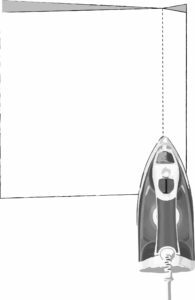 The guide fin goes in the seam as you are sewing, so if the fin is in the same place as the needle opening, then it is a stitch in the ditch guide foot, but if the guide fin is off to one side of the needle opening, then it is a top stitching guide foot. Feet are not very expensive and they make many tasks much easier, so I highly recommend investing in feet as you advance. Now it is time to add the button hole. I have not marked where the button hole should fall on the pattern, because this can vary from person to person. First decide which side you want to belt to emerge from. This is up to you although most warp skirts wrap right side over left side, so the belt emerges on the right side as well. 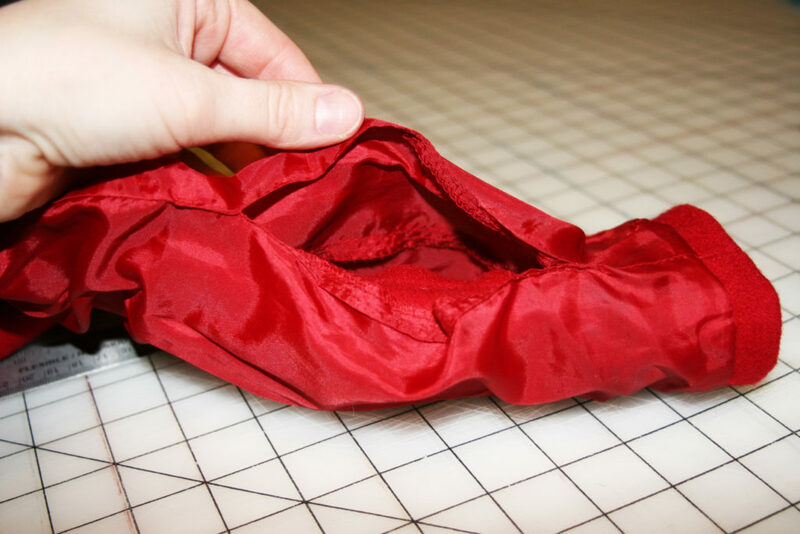 Once you have decided what direction to wrap the skirt you will want to put the skirt on and wrap it tight, then mark the button hole at least 3″ away from where the underside of the skirt meets the top layer. You want to give yourself a little wiggle room. You can use tailor’s chalk to mark it, or just put a pin where you want to place the button hole. 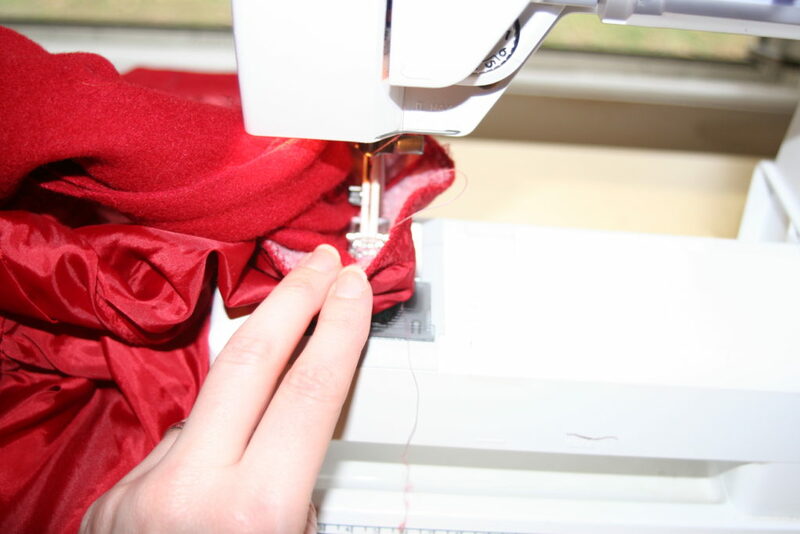 Actually sewing the buttonhole will depend on your particular machine. Since a lot of the girls in the sewing circle have Singers I have linked to a youtube video showing how to do a 4 step buttonhole on a Singer machine. 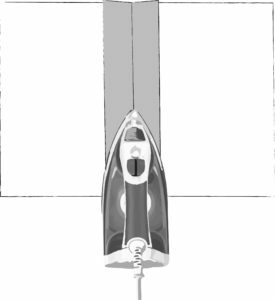 Make sure you have a foot on your machine that is either specifically for a buttonhole or that has enough room for the movement of the needle side to side. If your foot looks like this, then when the needle starts moving side to side to create the buttonhole, it is going to hit the foot and break. You need to have a foot that has an opening that allows the needle to move back and forth. Like this one. 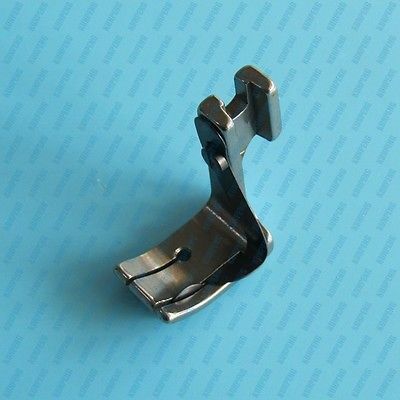 This is not a buttonhole foot, but it has a large enough opening that it would work if you do not have a buttonhole foot. You want to make the buttonhole as long as possible, but keep it on the belt and leave about 1/8″ at the top and bottom. Now that you have the belt pieces together and the interfacing added, you can set that aside for the time being and focus on getting the skirt ready. 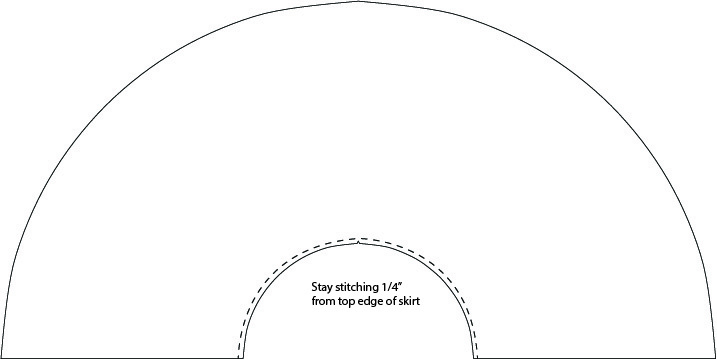 First you want to add stay stitching to the top of your skirt to prevent it from stretching out. This is just a row of stitching 1/4″ from the raw edge at the top of the skirt. 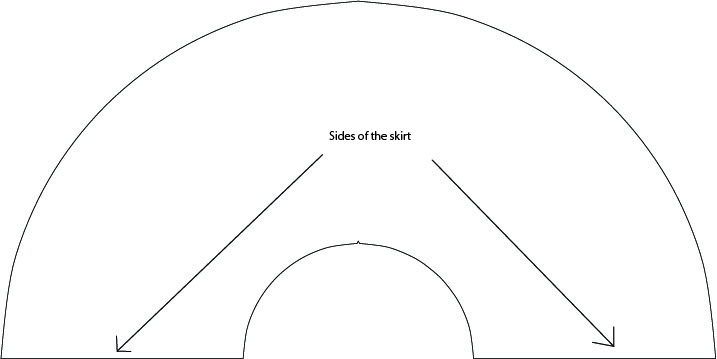 Next you will finish the sides of the skirt by folding the raw edge over 1/4″ and then again 3/8″ so that the raw edge is completely enclosed. 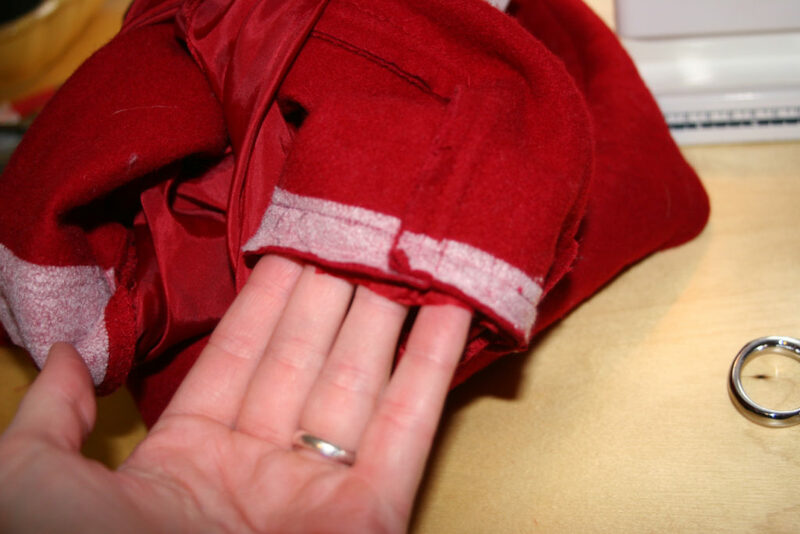 Then stitch 1/4″ from the folded edge to secure the side hem in place. Take the pins out before you sew over them. 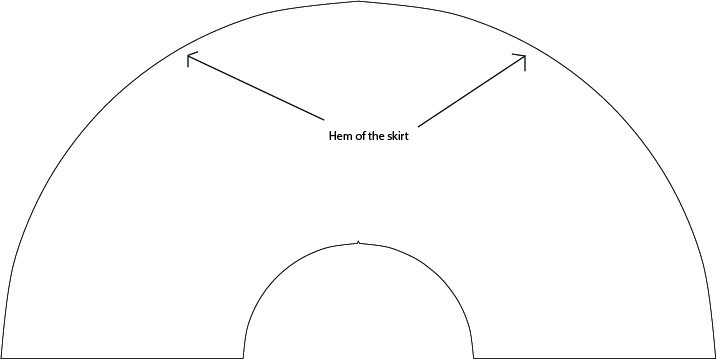 Then repeat this process again on the hem of the skirt. 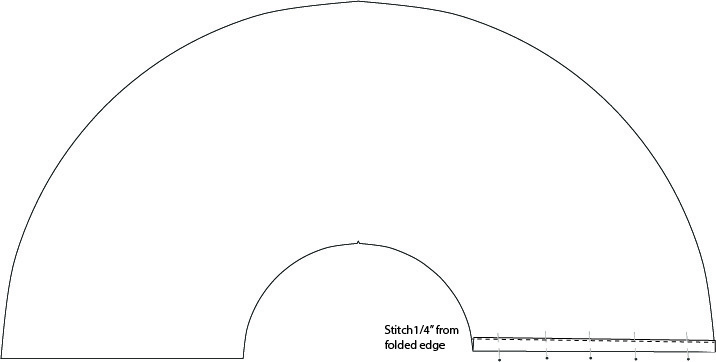 The hem will be harder because it is a curve and you are folding a larger circle into a smaller circle. 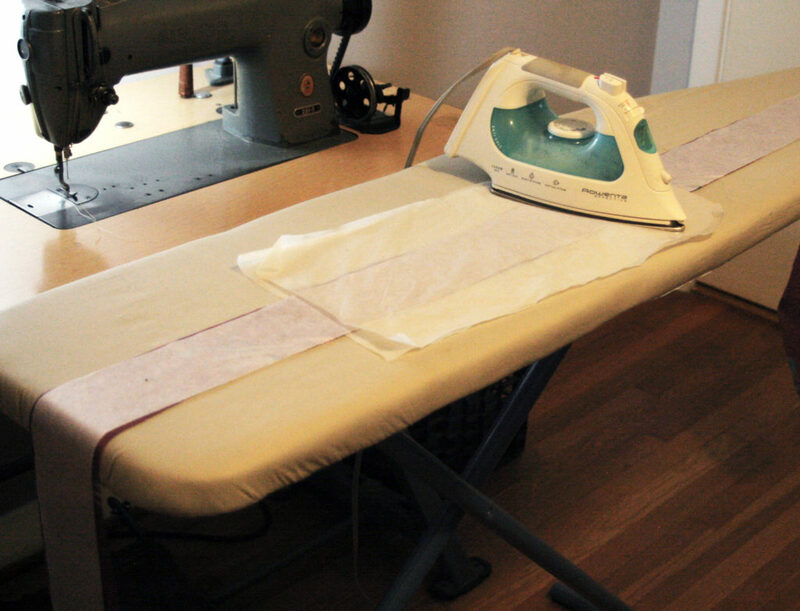 Use your iron and steam to help ease the extra material into the smaller area. Use glass head pins so that you can iron on top of them without melting the head. Another nice trick to help you have a crisp look is to add a few hand stitches to the edge/end of the hem to keep the excess from spilling out on the edges. Use a contrasting color so that you can easily see these stitches. This will make it easier to take them out after you have machine sewn the hem. Next is to attach the belt. The notches that are on the belt pattern will line up with the center notch on the skirt. The two sides of the belt will not be even because I have designed this skirt to tie on the side of the hip instead of the back. If you plan to tie your belt in the back then ignore these notches and you can position the belt to have an even amount of tie on either side of the skirt. First press the entire belt in half. Then lay the belt face down on the skirt, lining up one raw edge of the belt with the raw edge of the top of the skirt. 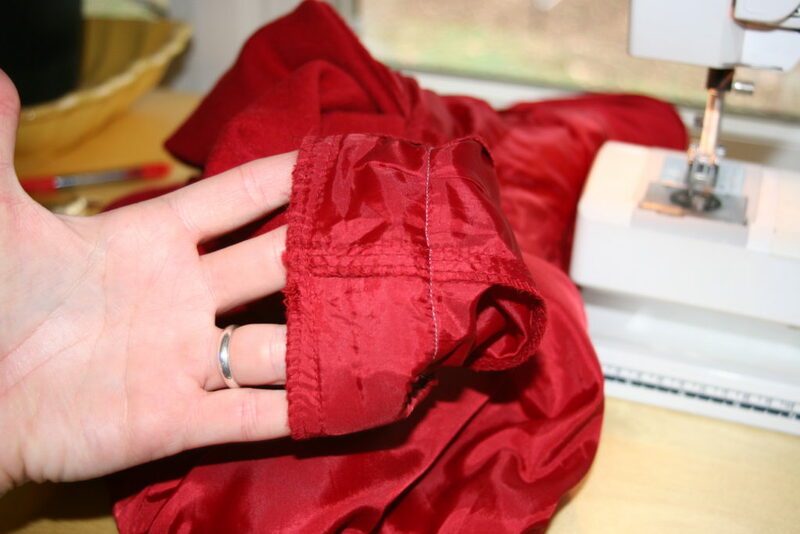 Sew only one layer of the belt to the top of the skirt using 3/8″ seam allowance. The next step can be a little confusing, so I’ve added step by step illustrations that hopefully will help. In order to finish the ends of the belt, you are going to flip the fold on the belt around so that the raw edges of the belt meet and the fabric is face to face or right side to right side. Sew the ends and the long side of the belt using 3/8″ seam allowance and come as close as you can to the stitching that joins the skirt to the belt without actually sewing onto the skirt. Make sure not to take more than 3/8″ seam allowance. If you take more then the belt will be narrow and it will be harder to turn right side out. Now you can flip the ends of the belt and press them flat. 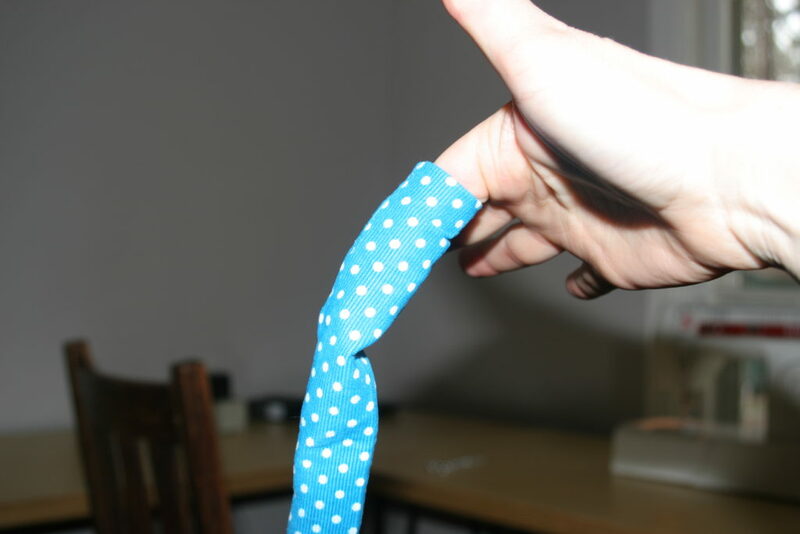 Once you get started flipping the ends of the belt, you can stick your finger down into the cone and use the friction of you finger to pull the material through. Once you have the ends turned right side out, you can use a chop stick to get the corners looking crisp. 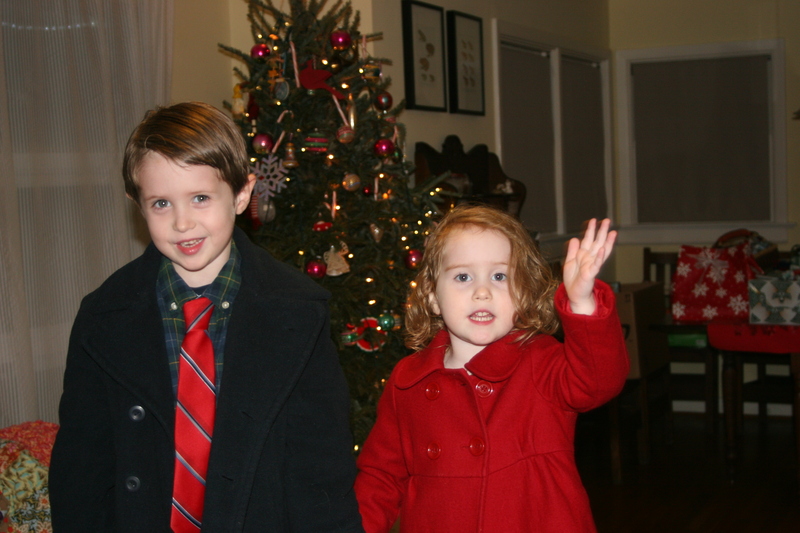 I needed to shorten the sleeves of my daughter’s coat for a Christmas party, so I took the opportunity to take some photos and share a really useful alteration with you. She has been wearing the jacket with the sleeves rolled up, but since this is such a quick alteration I decided to take the time to do it. 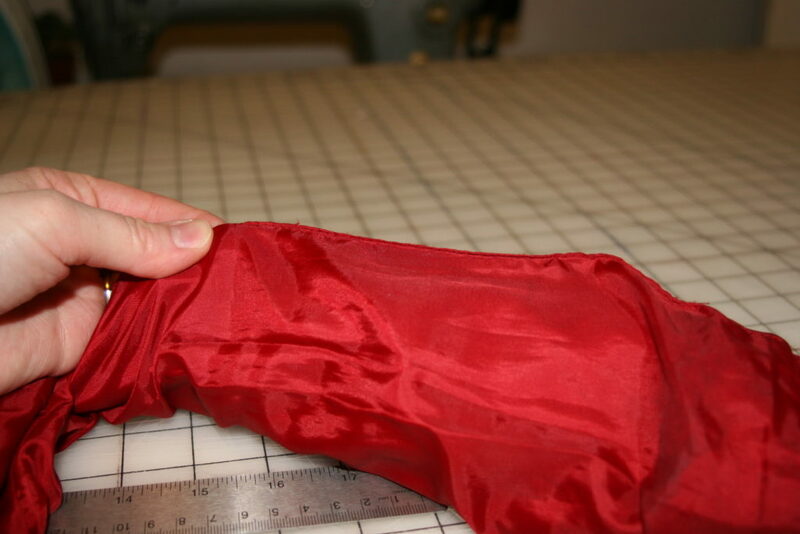 If you have ever turned a jacket inside out and seen a small area of top stitching on the lining of one jacket sleeve you may have thought that the sleeve had already been altered or maybe that it was a mistake in manufacturing. Actually it is intentional and it is meant to make the jacket easier to alter. I’ll quickly explain how this works and then show you step by step. The quick explanation is that you are going to undo the area of top stitching on the lining of one sleeve and turn both sleeves inside out through this opening. 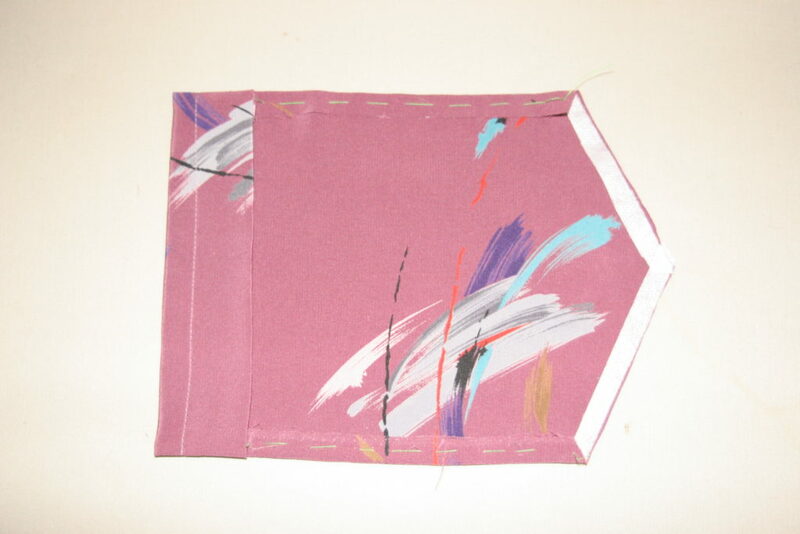 You then add stitching the distance you would like to shorten, away from the existing stitching and trim. 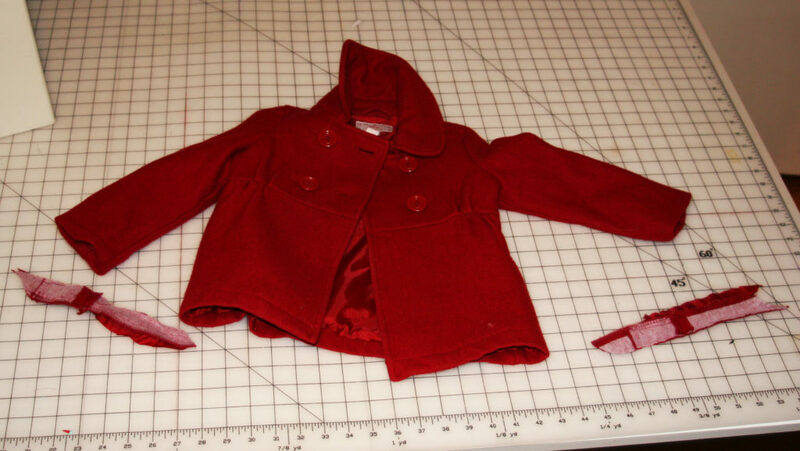 Pull the sleeves back through the opening, press, restitch the opening on the sleeve lining and voila you are done! 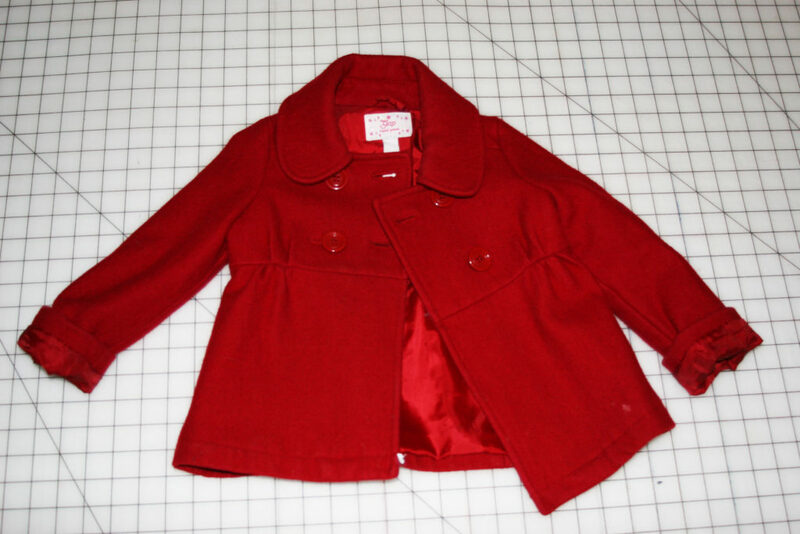 So this is the jacket before alterations. The sleeves are rolled up because my daughter has been wearing them like that for the last few weeks. Now for the step by step. Fist measure how much you need to shorten the sleeves. Note it somewhere. You will need that info later. 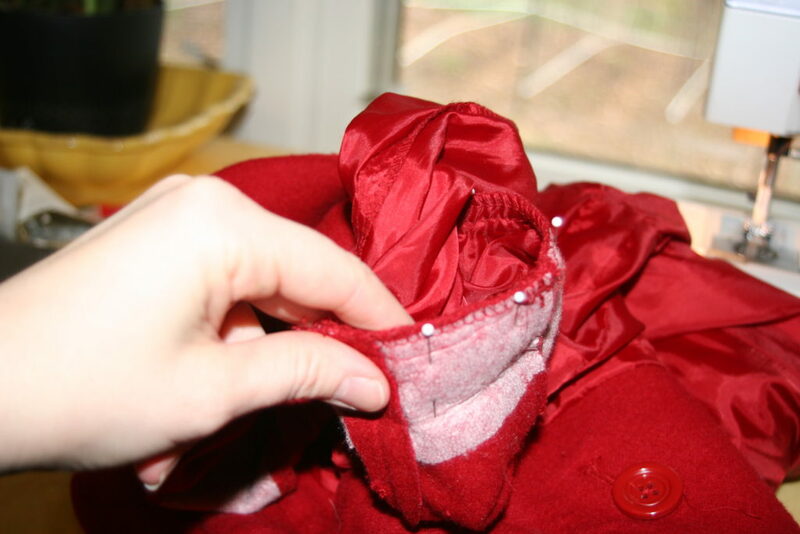 Turn your jacket inside out and find the area of top stitching on the lining sleeve. 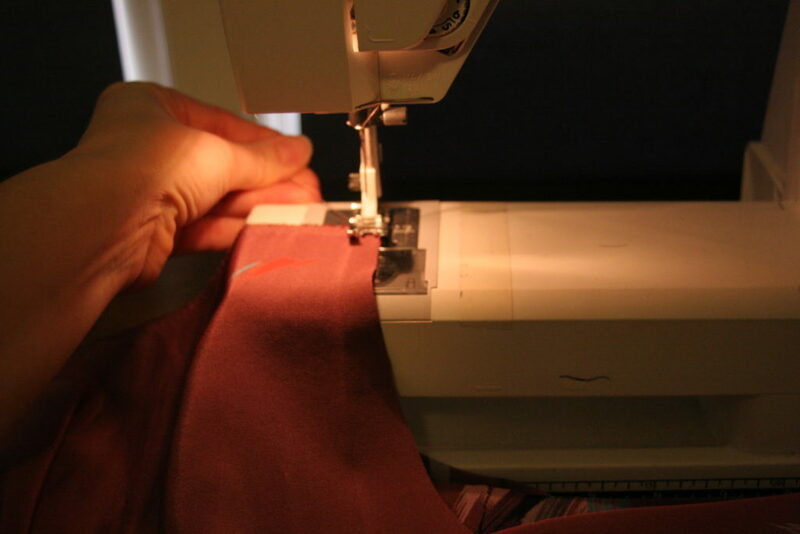 Release the stitching using a seam ripper. Don’t worry about reinforcing the ends. That was already done for you in manufacturing. Wasn’t that nice of them? Now you can reach through that opening and grab the opposite sleeve and pull it all the way through the torso area and out of the opening on the other sleeve. This is me sticking my arm through the opening and reaching all the way through the body of the jacket to the opposite sleeve to pull it through the opening. Then pull the end of the remaining sleeve through the opening as well. This should give you two inside out sleeve ends sticking out of the hole created by releasing the top stitching. There is probably a little bit of stitching that is holding the sleeve end to the seam allowance on the sleeve. This prevents the lining from pushing out when you put your arm through. Just note how deep the fold is and then release the stitching with a seam ripper. (Either write it down somewhere or do one sleeve at a time, so you can look back at the one that is still intact to see how much of a fold back is there.) You can see that there is a little bit of stitching there that is preventing the sleeve from laying flat. Once you have the fold back released, the sleeve should lay flat and you can add stitching the distance you would like to shorten the sleeves away from the existing stitching. 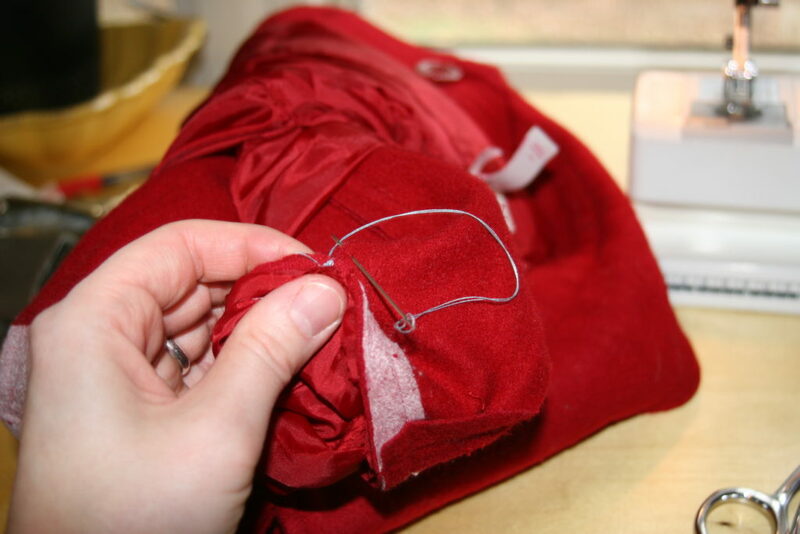 Use pins to keep the lining from sliding around during sewing, but remove them before your presser foot reaches them. I do not recommend sewing over needles not only because your needle will occasionally hit a pin and break, but also because pins do not allow your fabric to lay flat so you end up with little wobbles in your stitch line when you sew over fabric being held by a needle. 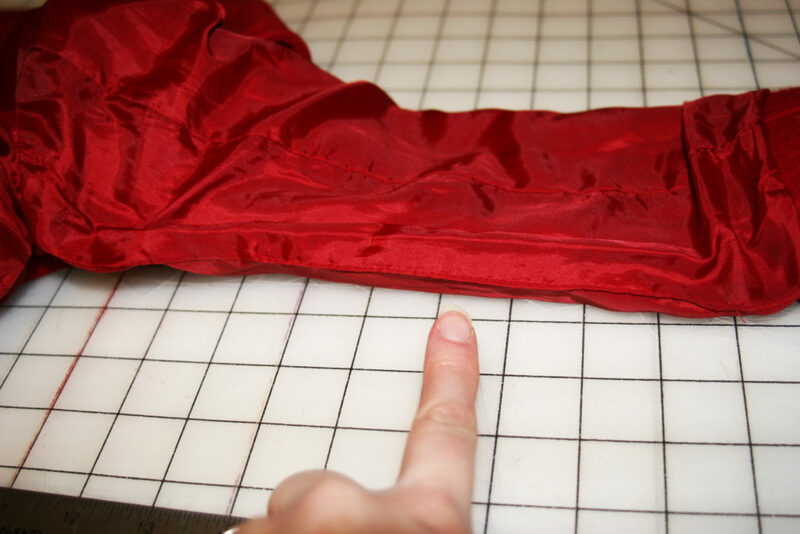 On most machines adult size jacket sleeves will fit around the sewing area. 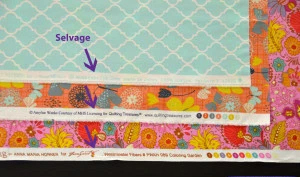 There may be a removable section on your machine that makes the sewing area smaller. This is exactly what that adjustment is for, fitting things like sleeve ends. However since this sleeve is on a child’s jacket so it doesn’t fit around the sewing area and I am having to kind of look down into a little hole. This is where pinning is really important. This is what it should look like when you are done. Hopefully you can see the second line of stitching. I wish I could say it is in a contrasting color so you can see it better, but in reality that is just what I already had threaded. I was trying to hurry. I trimmed the excess fabric, but if it is a lighter weight fabric or if you think you will need to lengthen the sleeves later, you could leave the excess. It will just add bulk. Next add the fold back. Remember this keeps the lining from pushing out when you put the jacket on. 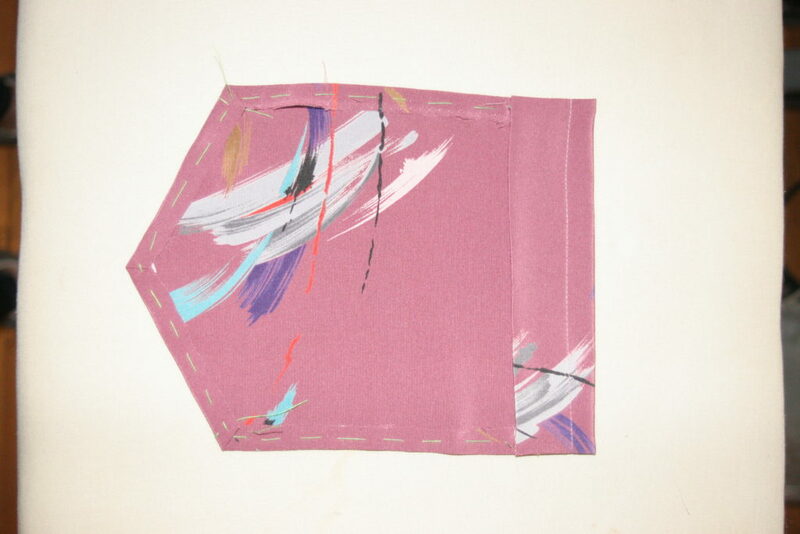 It is also the amount that the face fabric folds back into the sleeve. If you look at jacket sleeves you will notice that the lining doesn’t come all the way to the end of the sleeve. It is set back a little. This is a product of the way the pattern is made. The lining sleeve is shorter than the face fabric sleeve, but to make sure that the lining doesn’t shift when you put your arm through and poke out of the end, you need to secure the fold back on the inside of the sleeve. 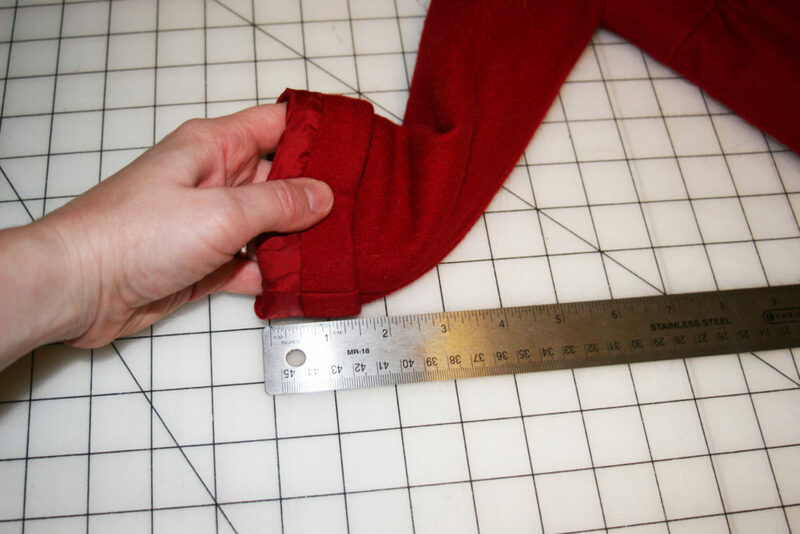 You do this by folding the end of the sleeve back by the amount of the original fold back and tack the end of the sleeve to the seam allowance on the sleeve seam. 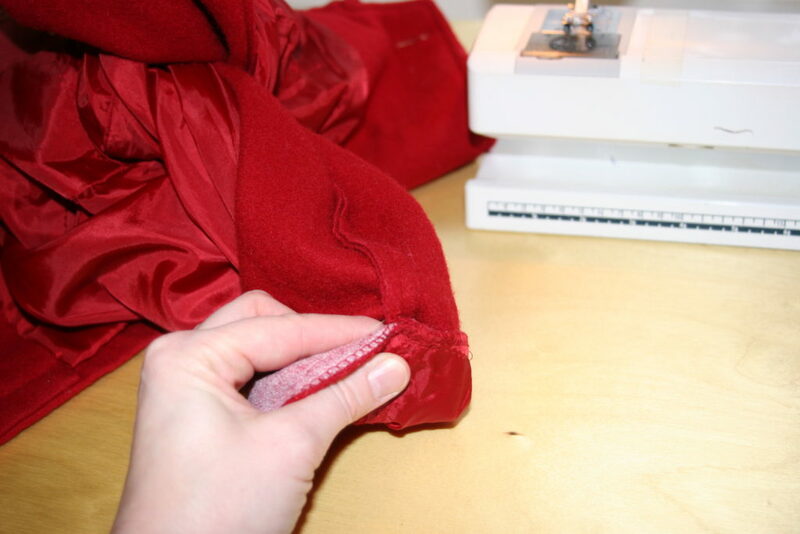 If there is more than one sleeve seam, then tack the fold back in several locations. Again, I usually have a hand sewing needle in my pin cushion already threaded, so this is just the color that was on there, but it does make it nice and visible. Once you have that done on both sleeves, you can turn them right side out again and top stitch the opening in the lining. This is what it looked like when I was done. Now all I have to do is press it and get all the dog hair off! Ready for the party! Once you have all your pieces cut out, find all your belt pieces and sew them together, matching the notches. You do this by looking at the short sides of the rectangles that make up your belt. Find the pieces that have the same number of notches on the short sides and lay them face to face with the notches matching. Face to face means that the right sides of the fabric are touching each other. 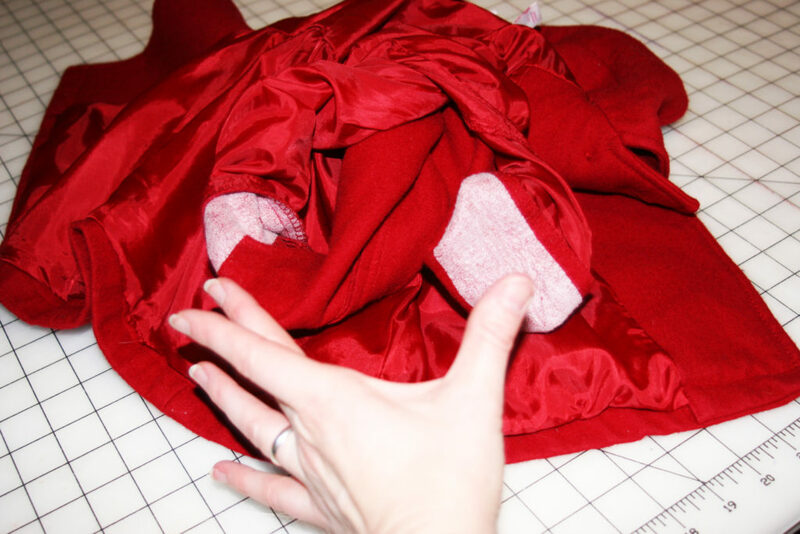 Use 1/4″ seam allowance to sew the pieces together. 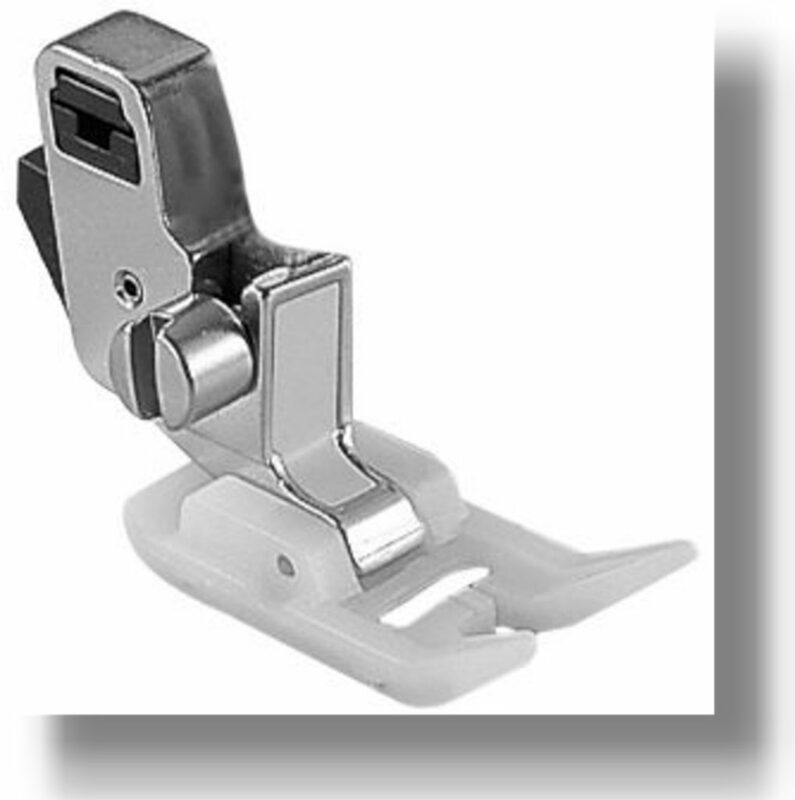 For most presser feet 1/4″ seam allowance will correspond to the edge of the presser foot. Remember to backstitch at the beginning and the end. When you have all belt pieces sewn together, first press the seams flat and then press them open. 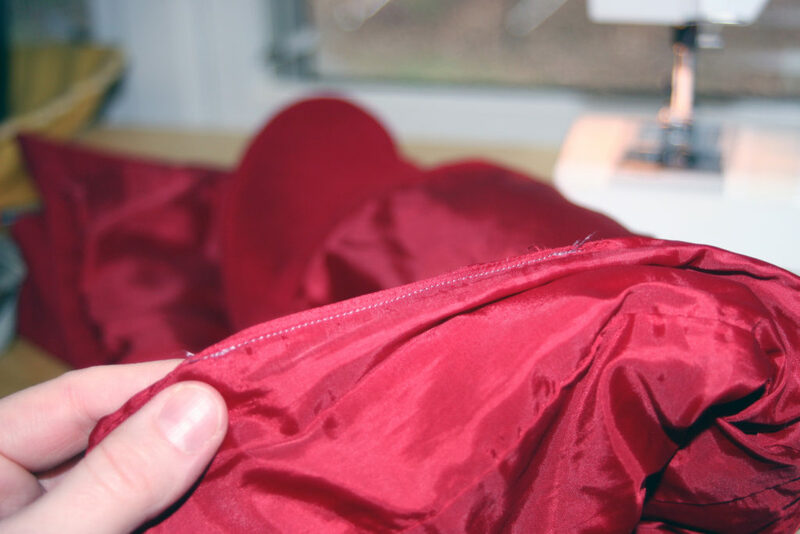 Pressing your seams flat first helps the top and bottom thread to meld together. The seam will look more crisp once you press it open, if you press it flat first. *You should be able to feel little bumps on the side that contains the glue.